Well, not really Christmas, but close! CHA has finally arrived. This means lots of new papers and products to play with. This translates into A LOT more books being made in my studio! My friend Judie called me last night from the convention floor. She just had to tell me that the Graphic 45 papers I have been lusting after are even better in person than what I had seen online. I cannot wait to get my hands on these! Infact I am so excited to get them that I have several ideas already in mind of what I want to make with them. . . I see some FUN new classes in the very near future! So much so that last night I had an idea for a new binding method and had to give it a try. I really wanted to do it with the new Fashionista papers, but since I don't have them yet I decided to make a mock up to see if my idea would work. This is the result. . . I actually think it turned out pretty cute. I used old Rusty Pickle papers and did a valentines theme. I added a Valetines poem and an area for a personal note. It is all made with bookboard, so it stands up really nicely all on it's own. And the new binding style I came up with allows it to fold up nice and flat. I think the idea is a keeper! Stay tuned to see when the Fashionista version comes to the class schedule. You can click on the picture to see the rest of it. Well, it's only a few more days until the BIG Game - who do you think will win? In our house it is a "win-win" situation. Gary and his family are HUGE Steeler fans (they're from PA) and Gary also likes to root for the home team. So either way, Gary will be happy. And if Gary is happy, I am happy! It is also only a few more days until I have a dentist appt! YUCK!!!! Friday I go and I am already dreading it! I am hoping it wont be as bad as I feel it will be. Tuesday Gary goes to have minor surgery. So we will be happy to accept any and all prayers. I hope life is treating all of my friends well this week! Talk to you all soon. BTW - did you notice the new "Quote of the Day" feature on the right? I love quotes - Enjoy! First off I have to say. . .
WOW! How about those Cardinals!!!! This is my man watching the game today - note: we have a HUG TV inside, but he needed to watch these two games in the "comfort" of his man cave. While he watched the game I finished up this book for my March class at the Creative Quest. The best part of this book was the reaction I got from Gary about it. He really loved it and said it made him feel very special. SCORE! (lame attempt at sports humor) That is the best compliment! Soon, I will try to post some pictures of Gary and my impromptu get-away on Friday. We headed up north to Jerome (LOVE that place!) and found snow on our way! It was a great day! We had the whole house to ourselves since Friday. Liz was house sitting, as was my Mom. Monkey and her parents headed to Calif for the weekend, so Gary and I were on our own. It was quiet, but it sure was nice! I hope you all had a great weekend too, and that you still have one more day of it thanks to MLK. What a BEAUTIFUL and FUN day we had today! You gotta love January in AZ - it is just beautiful. Cool, but sunny days - anyways it is cool for us, in the low 70's. Gary had some comp time he had to take so he is off the rest of the week. He is so excited to get to spend some full days with Monkey. He took her out to lunch today and then to work to show her off a little. Once they got home the three of us played out front. First in the wagon (dang! I wish I had my camera out then) Gary pulled Monkey & I both around the block in wagon. Then my little Monkey pulled me around on the driveway in her wagon. 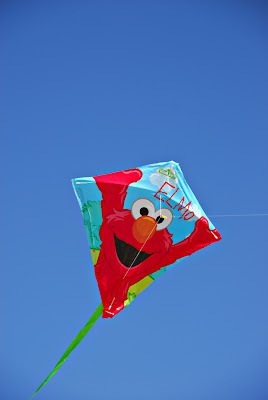 Then I remembered I had bought this Elmo kite for our trip to CA this summer and it never got used. 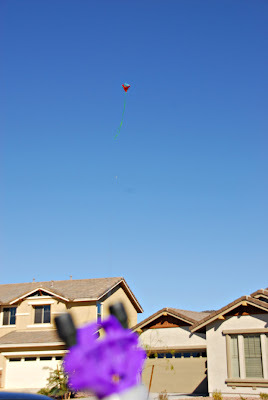 So I got it out and Gary got it flying for her even though there was very little wind. She loved it! While Gary was getting it ready I went inside and got the camera. I am so glad I did. The got 2 spools of string on it. 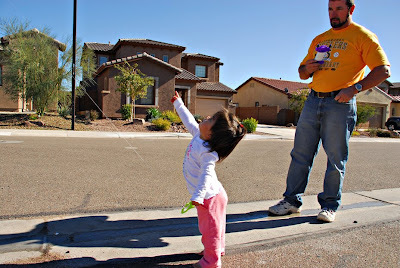 She was just thrilled when Grampa let her hold it and be in control! Can you see it spinning here? It was really climbing high! I just love this picture of the two of them - I wish it was a little sharper. But I am just glad I caught it. After awhile it was time to put it away. As it got closer and closer to her, she got more and more excited and would just squeal! 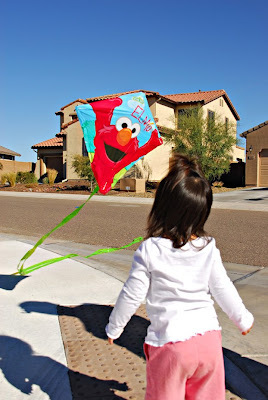 She yelled when Elmo finally came crashing down! 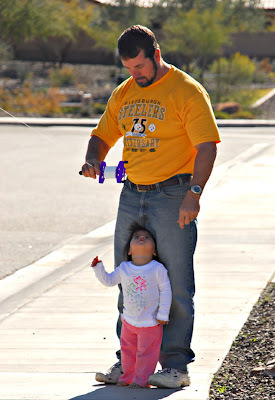 I can't wait for tomorrow - Gary and I are taking her to Lake Pleasant for the afternoon. 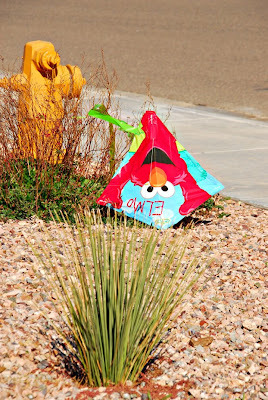 I think we will take Elmo with us again. Hopefully I will get some good pictures of her 1st trip to the lake! Can you believe it - no posts for 2 weeks and then 2 posts in one night! Well, I just had to mention that CHA is only about a week away and we will all be bombarded by new and exciting products. But the one I am REALLY looking forward to is the release of the new Graphic 45 papers. OMGoodness are they delicious! Trust me, you will be seeing some projects and classes coming out of my studio as soon as Kathie gets these into the store! If you want to check them out now click on the links below, you wont be sorry! I got to see 7 Gypsies' new catalog today also, there are some really yummy new papers there as well. It sounds like it's gonna be an expensive 1st quarter for me!!!!! 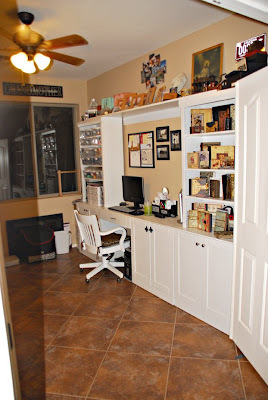 I have had lots of requests to post photos of my studio since I started my blog. This afternoon I was asked once again. So, tonight I took some photos of it and some of my favorite organizational ideas and my favorite tools and products to use. The photos are far from stellar, but I hope you will enjoy the tour of my favorite room in the house. 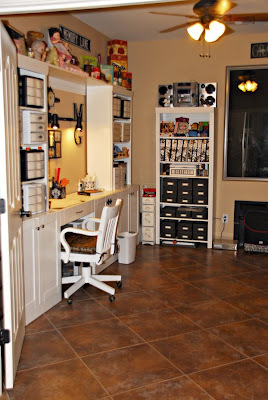 #1 - This is MY Studio as you enter through the double doors. It is the happiest place in the house and it seems that everyone eventually ends up hanging out in here. Notice there are no curtains in here. It is the only room in the house without them. I have been looking for just the right ones and can't find them. I guess I will be sewing this spring! 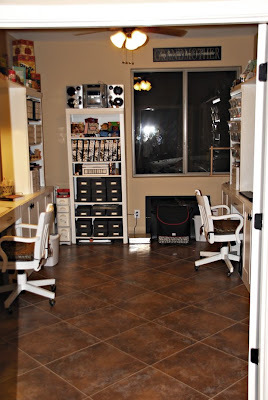 #2 - I have my studio set up into 2 "zones" if you will. This side is the "play" side. Just about everything is within hands reach. #3 - This is the "business" side. The computer is here and unfortunately I even have to pay bills in this zone. But mostly I use the computer for more creative reasons! 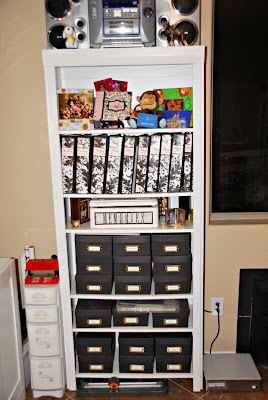 #4 - I added a long white shelf over top of the 2 towers in both zones. On the business side I have all kinds of special treasures from my Doodle and my brother. As well as my very first camera and favorite pictures of me playing in the fall leaves in Arkansas. 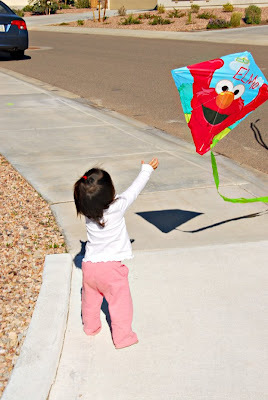 #5 - On the play side, I have some of my favorite childhood toys and my favorite books from when I was a little girl. Like I said, this is MY studio and it is filled with all manner or things that make ME happy! 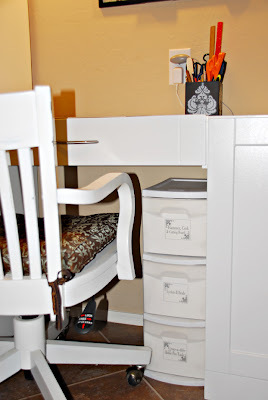 #6 - did you notice that all of my little plastic drawers have white fronts? Well, I HATE clutter and the very nature of any art studio is to have lots of clutter. I have tried my very best to eleminate as much of that as I could. And even though everything was neatly packed away in these little drawers, the visual clutter from the clear drawers made me crazy! So I made white fronts for all of them and labeled each one so that I would know exactly what was in each one. It took about 8 hours to do them all, but it has been well worth my effort! #7 - This is a bookshelf that is mostly devoted to photography. All of the binders you see there are full of old slides or 35mm negatives. That's ALOT of negatives and slides! All of the black boxes on the bottom 3 shelves are FULL of 4x6 printed pictures. Everyone and every holiday has it's own box (or 2). Of course Monkey has a nick-nack shelf in my studio as well. 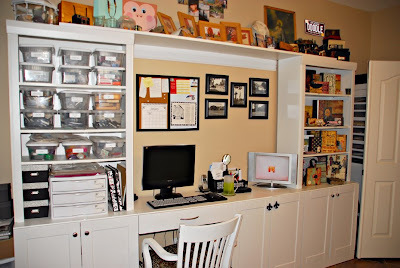 The skinny white drawers to the left are where I store my Sizzix dies and the machine sits right on top. It was sold in the bathroom dept for storage in tight spots in a bathroom. 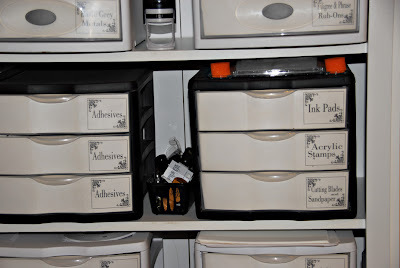 But with it's 2 different sized drawers it was perfect for my dies. My alphas fit perfectly in those shallow ones and the big dies in the deeper ones. #8 - Another thin tower under my work surface in the play zone holds all of my (many) brads and eyelets as well as my big ol' hammer and crop-a-diles. They are right at hand when I need them and out of the way when I don't. 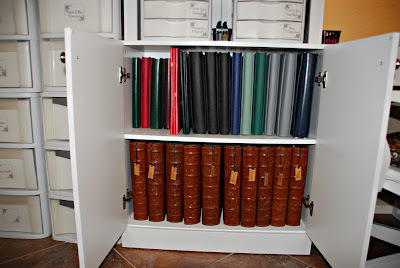 #9 - This bookshelf is on the business side, these are most of the books I have made and taught. I really enjoy this shelf, but I need to figure out what to do with the new ones I make? I might have to put some of them on ebay to sell to make room? 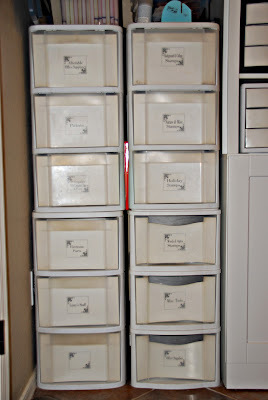 #10 - these are 12x12 drawers and this is how I store all of my scraps. Yeppers, that's ALOT of scraps! And yes they are all sorted and organized by color and or theme. No sense in saving scraps if you can't find the ones you need right? 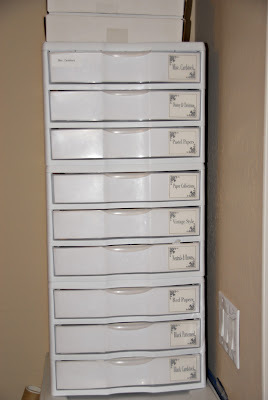 #11 - More drawers - these hold all of my wood mounted stamps, paints and alterable office supplies (tags, clips, envelopes, etc). On top I am ashamed to say is a bit of clutter. But most of it is stuff for classes. It is not a big room, and sometimes there is no "good place" to store class supplies until they get used. But when the double doors are open (which they usually are) all of this is out of sight! #12 - Just more drawers all with in reach while I am creating. I hate to have to get up and down. #13 - Single paper storage is inside the bottom cabinets. This does not at all represent ALL of the paper I have! The paper I buy in bulk and the parent sheets are elsewhere. But again this is all handy while I am sitting in my chair creating. 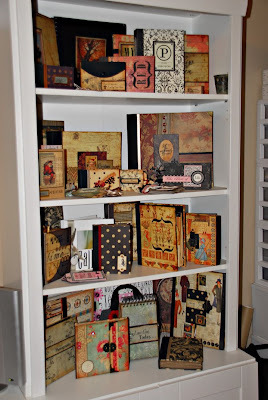 #14 - These are just a portion of the 12x12 traditional scrapbook albums I have. When I first started scrapping I bought whatever album I felt like. 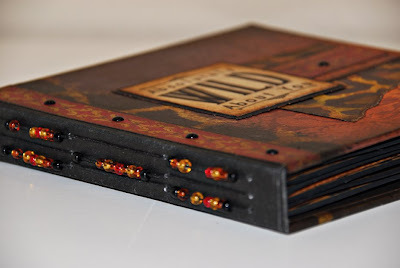 As I got more serious about it I bought 20 of these embossed leather albums that hold 50 12x12 pages each. Now everyone and every holiday plus vacations have their own album. And of course I made hanging tags for each one with the album name on it. Can you tell I LOVE labels???? 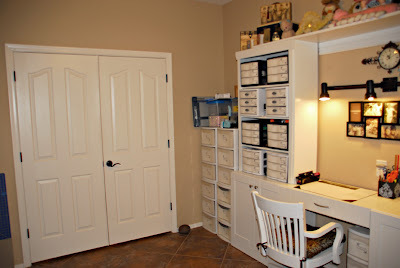 #15 - this is ribbon and large punch storage. It is also where 8.5x11 paper and all my zipper baggies for classes are stored. Not as neat as I would like it, but it is all behind closed doors so I deal with it. 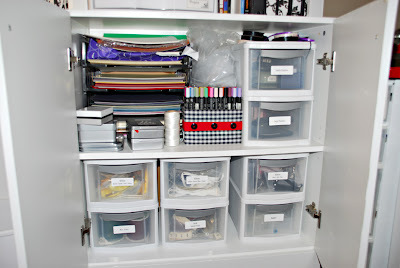 #16 - This is one of my fav organizational tools! 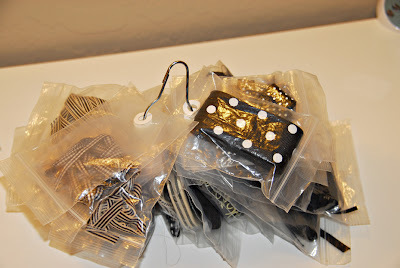 A bunch of small zipper bags and a cheap metall shower curtain hook! 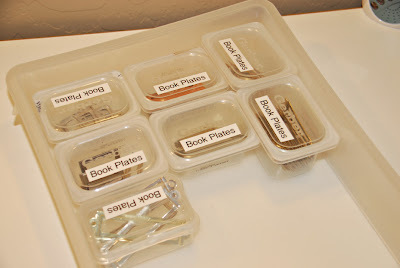 I use this system for ribbon as well as chipboard letters. So everything on this ring is black ribbon. There is a red ribbon ring, a pink one, white one, you get the idea. For chipboard letters, I put all of the A's in one bag, all of the B's in another and so on. Makes it sup easy to find exactly what you are looking for! #17 - remember when we were kids and your Dad would store all of his nuts and bolts in glass baby food jars in the storage room? Well, the new baby food jars are square, have nice lids and are plastic! And they fit perfectly in my little drawers!!!!! I LOVE these things! These next few items are my FAVORITE MUST HAVES! PVA for all of my book covers! 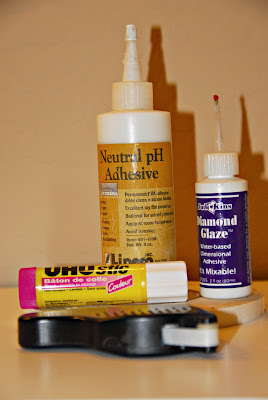 Diamond Glaze for gluing all metals and small items! UHU Glue sticks - the best glue stick for when you need one of those. I buy them by the case! Forever Tape - For a SUPER STRONG hold on anything! Again, I buy it in bulk! Herma Dotto REMOVABLE - I could not do all of my fussy journaling without it! 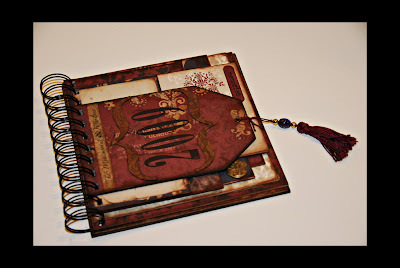 *An oldie but a goody - My Sizzix Machine! I love it because it will cut through chipboard! *The Bind-it-All. Need a book fast, don't feel like sewing - BINGO! 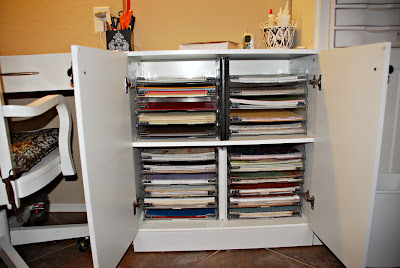 *My large surface light table - again, I could not do all of my fussy journaling without it! *Another oldie, but goody - my Fiscars Rotary Cutter. I have several others but this will always be my favorite. It is a dear old friend. I've had it for 10 years now! * My Duraheal Cutting Mat & Acyrlic Cutting Guide. 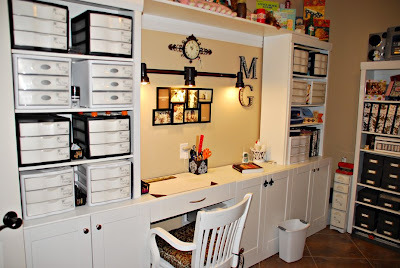 I love this for cutting all of those oversized papers I use as well as for all of that book board. * The Stanley Utility Knife. This is how I cut all that bookboard and paper on the mat. 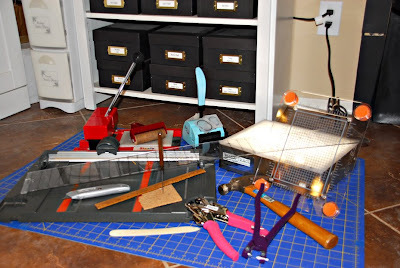 *Fiscars Stamp Press - this is the best tool if you like to use acrylic stamps! It is perfection! * Crop-a-dile. How did I live without this? Lizzy actually bought me the BIG one for Christmas this year. *The Home Pro Tool - WOW! 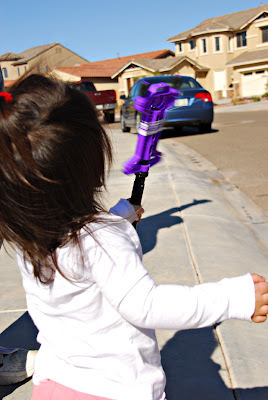 You will never set another eyelet with a setter and hammer again after using this thing! * My Wooden Ruler that I got when I was in grade school. I LOVE this thing. It only has marks every quarter inch! You can't find those anymore! * My Hammer that my Doodle bought me. I use it for lots of things - especially for flattening the backs of brads. * My Wooden handled Awl - Love this thing - I got it at the swap mart in San Diego several years ago for $1 and it is the best one I have ever had! * While we are talking about brads and my awl - I have to have my piece of Cork to use with both items. Unfortunately Monkey got a hold of it and it's in pieces now. * My Bone Folder - couldn't live without this thing either. * Last but not least my Speedball Brayer! That's right, Black Mini Brads and distress inks! 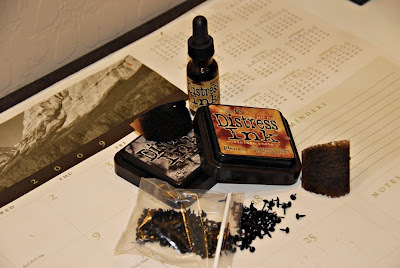 I love almost all of the distress inks but my very favorites are the Vintage Photo and the Black Soot. So this wraps up our tour - what do you think, was my studio what you expected? Were you surprised at some of my favorites? WOW!!! It seems like FOREVER since I have posted here. Seems life just keeps getting ahead of me. I have the best intentions in the world to post on my blog and call and write my friends and somehow I just don't seem to get it all done. I hope this will not be a trend for the whole new year? I have been keeping busy with Classes at CQ - either teaching them or planning and preparring for them. I have a fun one coming up in February, on the 16th. It is called "The Monumental & Mundane 2009". That sample will be going up in the store this week. 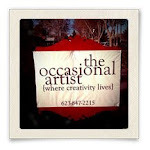 I also have the sign-up info here on my blog (to the right). I have another book sitting on my desk that will be taught in April. This one is going to be for your man! It is called "Absolutely Wild About You" and is featuring the Marah Johnson Untamed papers. Have you seen them? They are so cool! This will be a great Father's Day gift for your hubby and since you will make it in April, you will have plenty of time to fill it up with pictures and stories. Stay tuned, I will get it posted here soon. I also have another class in March - it has yet to materialize on my desk yet - hahaha. But hopefully soon. Oh, I also haven't told you all about my Monkey & Me Book that I did. It turned out super cute and Monkey loves it! You wanna see it???? Just Look to the right and you can take a peek. 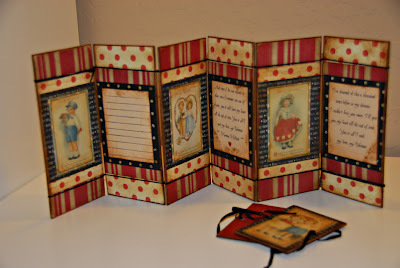 This is my cheater book, but I am thrilled to have gotten it done. It was one that was very important to me to get done this year. I have made a couple of these online books now and I really enjoy them. But now I have the "digital bug" and I want to start buying all of that now! I tell you, photography, scrapping, book making - it is a serious additiction and it just keeps leading you to more and more addictions! As well as working on class samples I have been busy working on a personal project. I am doing a fun, hanging book about all of our family's Christmas traditions. I am really enjoying working on that one. With all of this crafting and then living life, my house is truly suffering! I keep telling my Mom that I think there are little Imps hiding in our house that are making these messes each time I walk out of a room! Well, it is late and I have no real exciting news or words of wisdom to impart tonight. So, I will go now and hope you all are having a GREAT start to the New Year and that it only gets better for you each and every day!